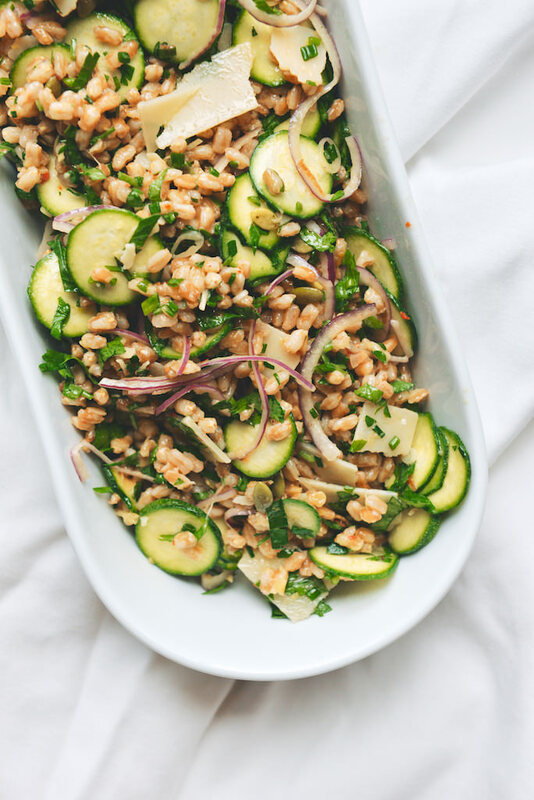 I think this salad is particularly well-balanced–hefty and satisfying, but also bright, fresh, and just a little spicy. 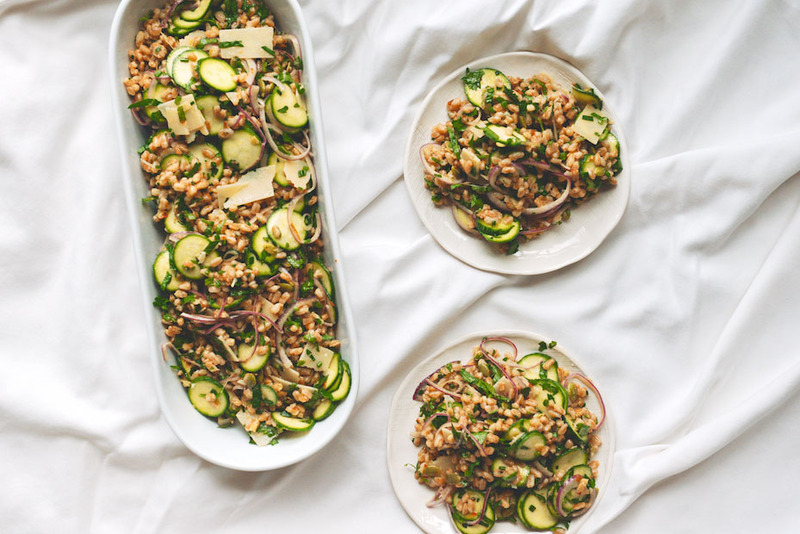 All the salad-parts can be prepared while the farro cooks and cools. If you don’t enjoy a lot of heat, use a less spicy pepper. Set a pot of salted water (4.5 cups water to 1 tablespoon salt) on the range. Add the apple cider vinegar and the bay leaf. Bring the water to a rolling boil, and then add the farro. 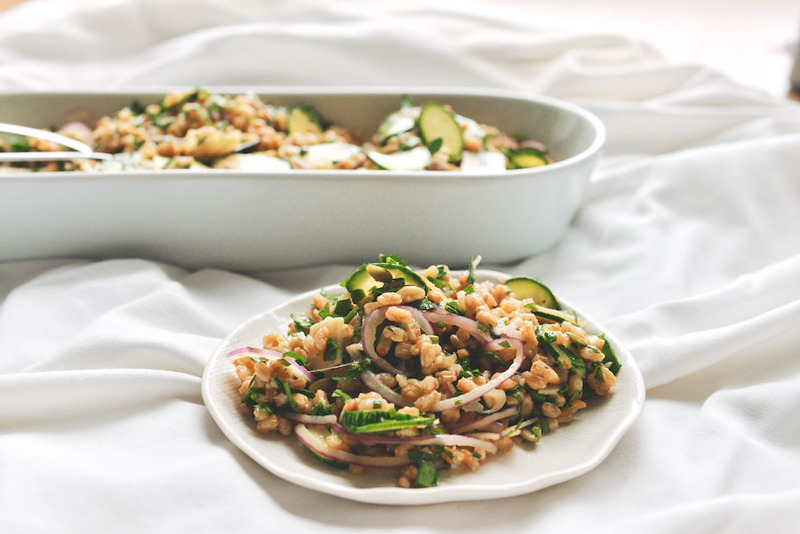 Lower the heat to medium-high and cook the farro uncovered for 30 minutes, or until chewy and al dente. 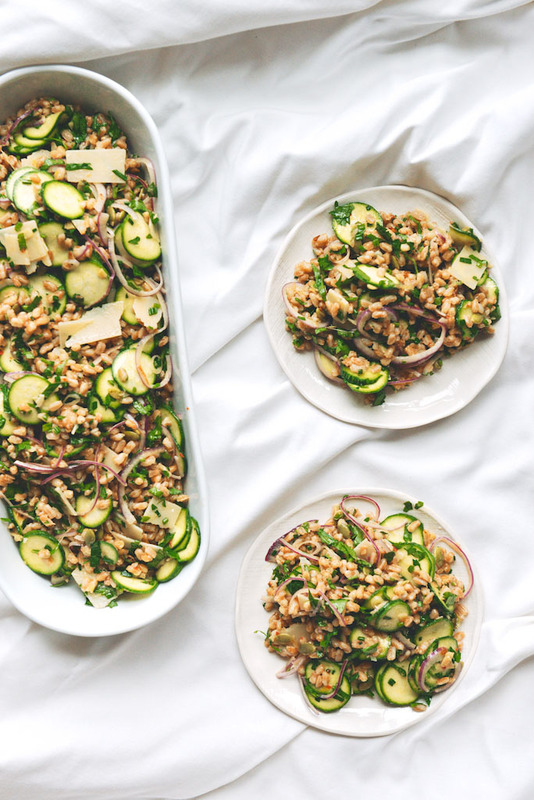 Drain the farro, and allow it to come to room temperature. 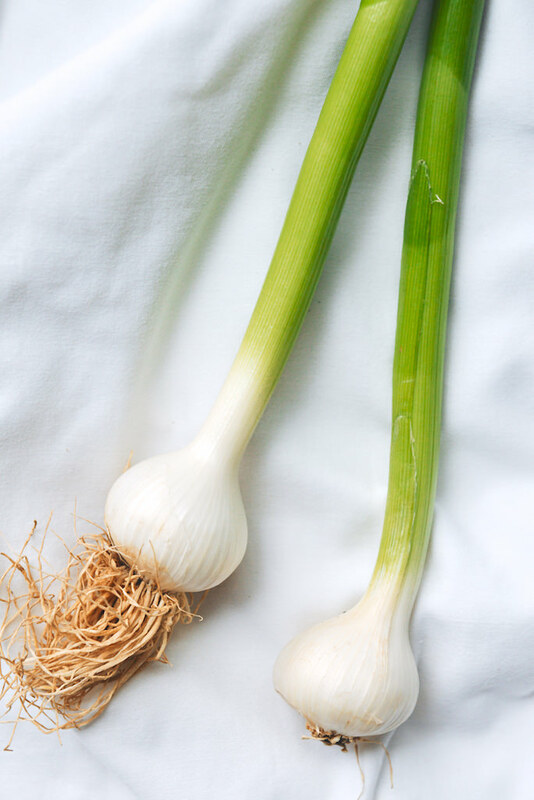 Meanwhile, soak the onion slices in lukewarm water for 10 minutes, to make them less harsh; drain and dry the onion slices. Meanwhile, in a medium bowl, toss the zucchini coins with the remaining 1 teaspoon salt and 1 teaspoon lemon juice. Let the zucchini sit for 15 minutes, until it slackens. Meanwhile, over medium-low heat, saute the green garlic and the pepper with 1 tablespoon of the olive oil. When the vegetables are translucent and soft, spoon them into a mortar and pestle. Add the remaining 1/4 cup olive oil and the zest and juice of 1 lemon; make a vinaigrette/paste. (If you don’t have a mortar and pestle, this can also be done roughly with a bowl/large fork.) 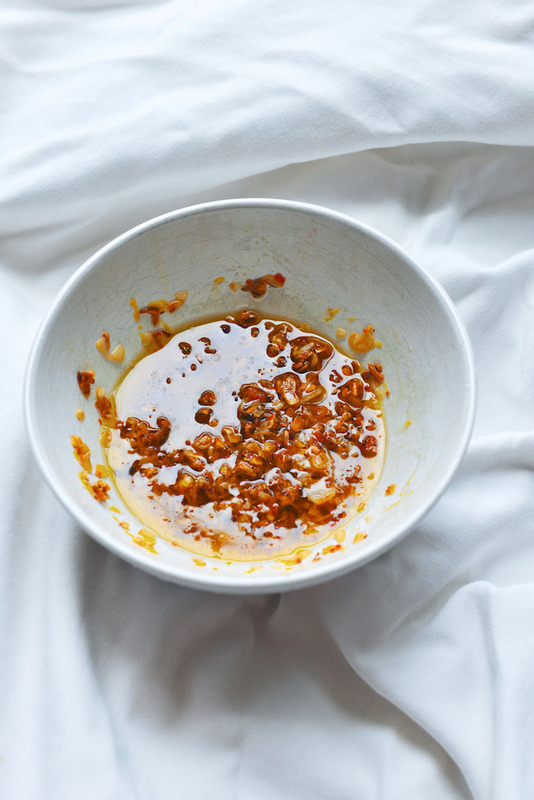 Fold the vinaigrette into the farro. 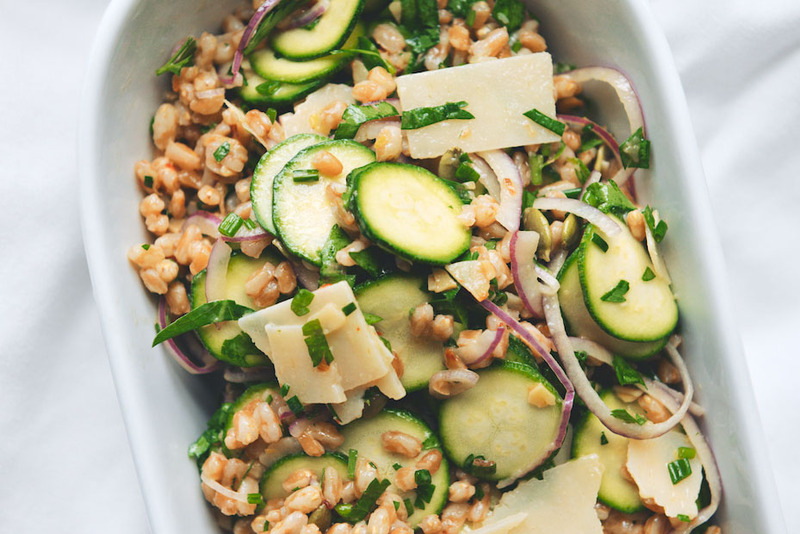 Fold the zucchini into the farro. Fold in the Parmesan shavings, chives, parsley and pumpkin seeds. Adjust the lemon juice, if needed. Serve slightly warm, or at room temperature. Delicious! 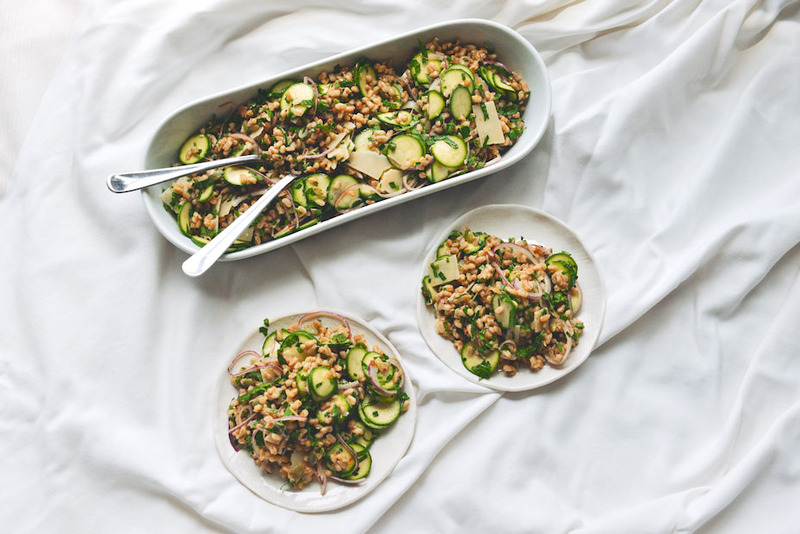 When my friend first made the Charlie Bird Farro salad, she too used apple cider vinegar. It was so delicious, but when she gave me the recipe I saw it calls for just straight apple cider, not vinegar. I think this is the best mistake ever! We both continue to make it with vinegar! Going to make your version with zucchini today. Thank you! I bow down humbly in the presence of such graesnets.